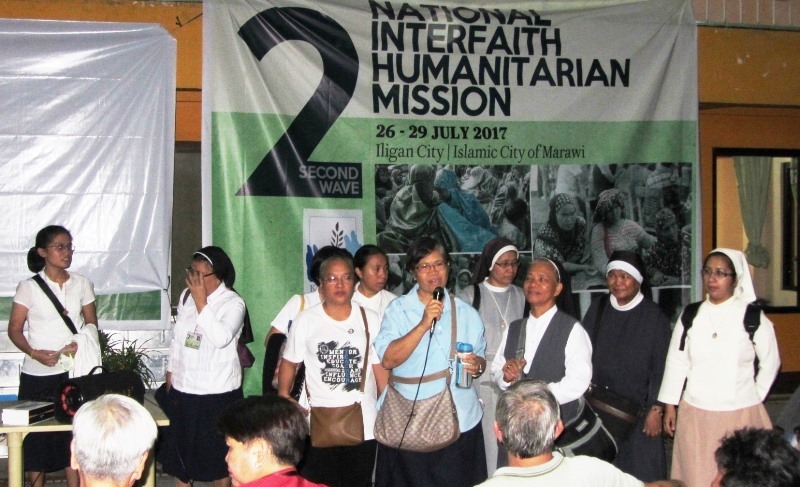 ILIGAN CITY – Amid the palpable presence of martial law here, delegates to the second wave of National Interfaith Humanitarian Mission (NIHM 2) gathered in this city starting July 26 for solidarity action with Marawi evacuees. 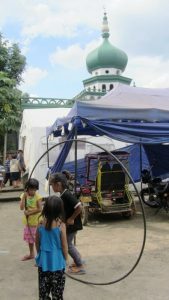 “When the first mission was held the evacuees were still new to evacuation and their experiences still raw,” said Amirah Lidasan, convener of Kalinaw Mindanao and officer of Moro Christian People’s Alliance. During NIHM 1 the evacuees recounted their stories of rushed or forcible evacuation, fears of being hit by stray bullets or aerial bombings, and the ensuing hardships in evacuation centers. Most came unprepared for evacuation beyond two to three days, which was their usual experience with evacuating from past armed conflicts. But now they have been more than two months away from home. Worse, their days as evacuees may stretch as long as, if not longer than, the government’s newly extended martial law in Mindanao. “Martial law really created a humanitarian crisis and now, even worse, the evacuees are facing repression,” said Lidasan. More than 400,000 have become evacuees after martial law was declared in Marawi. In the face of increased restiveness from evacuees, the government seems to be tightening control over them, Kalinaw Mindanao reported at the start of NIHM 2. Evacuees badly want to go back home to Marawi now, Lidasan said. In fact, last July 22, while a joint session of Congress was deliberating on the extension of martial law, the Marawi evacuees in Iligan held a protest rally for the first time. Four youth volunteers were “invited” and questioned at the police precinct. Lidasan said they received reports that soldiers from the Armed Forces of the Philippines have been guarding the evacuation center or checking up on them more frequently. In some evacuation centers, government soldiers reportedly listed down the names of the protesters and forbade them from joining organizations. Kalinaw Mindanao also received reports that some local government executives have been constraining the evacuees’ movement. Lidasan said local government executives and the soldiers have barred the Marawi evacuees and supporters from holding even symbolic actions for reclaiming Marawi. 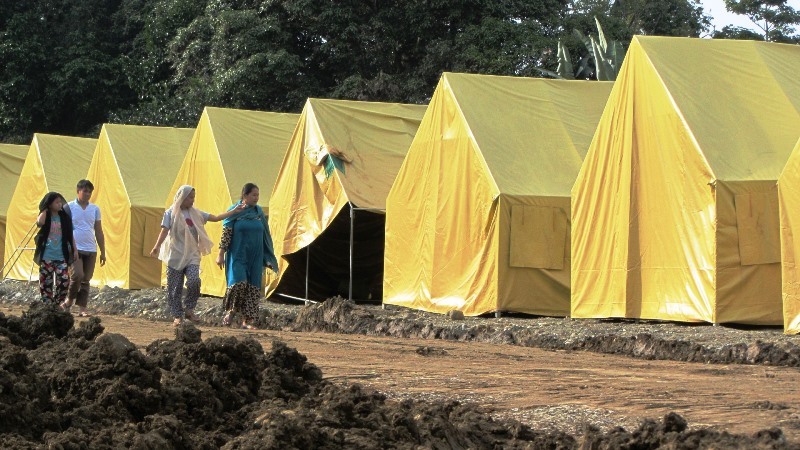 Kalinaw Mindanao has continued its assistance to the evacuation centers after NIHM 1. “Groups helping them now must go beyond providing humanitarian relief and psycho-social services: they need all the help they can get in giving voice to the bakwit’s desire to reclaim Marawi,” Lidasan said. The NIHM 2 delegates saw with their eyes the increased troop deployment in Mindanao provinces. Heavily armed government soldiers aboard military trucks and armored carriers traversed the road to Lanao while several military checkpoints were set up on the highway linking Cagayan de Oro, Iligan and Lanao provinces. Commuters were required to get off at some of these checkpoints and show their government-issued IDs to the soldiers. Yet, the soldiers’ reasons for being there in large force, exerting control even on local government executives beyond the three villages in Marawi where they reportedly remain, is highly questionable. According to Beverly Musni, vice-president of Union of People’s Lawyer in Mindanao, this raises a lot of questions why such a huge number of government troops with such a deafening aerial support couldn’t, until now, deal a decisive blow to the supposed target enemy. The NIHM 2 will still provide relief and psychosocial services to the evacuees and continue documenting the human rights situation. But a new highlight this time is its solidarity and support to the public presentation of a Marawi Crisis survivors’ movement. NIHM 2 is led by Kalinaw Mindanao and convened by several organizations across Mindanao. These include Balsa Mindanao, Moro-Christian People’s Alliance, Suara Bangsamoro, Sisters’ Association in Mindanao, Kawagib Moro Human Rights Alliance, Barug Katungod Mindanao, Tulong Kabataan Network, Kusog sa Katawhang Lumad sa Mindanao and the Rural Missionaries of the Philippines. NIHM 2 will be held until July 29.